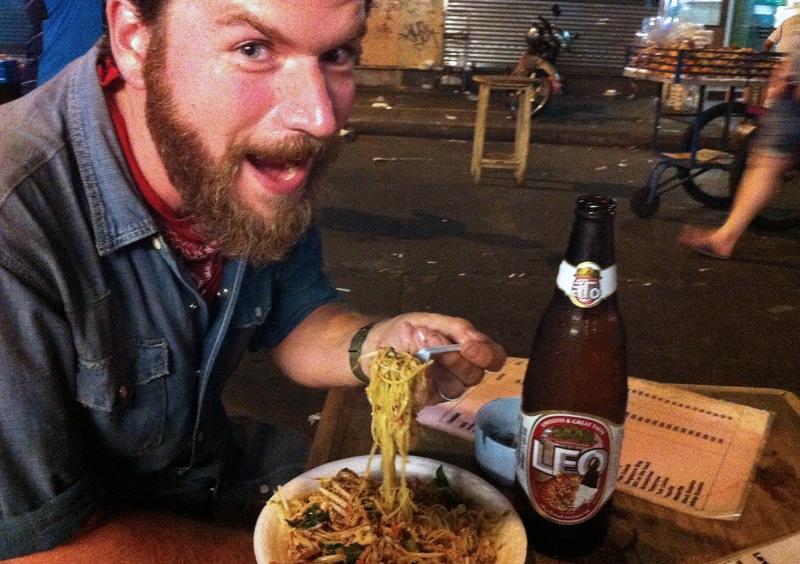 Street noodles and beer on Khao San Rd. Oh you know, Tuesday night is all. 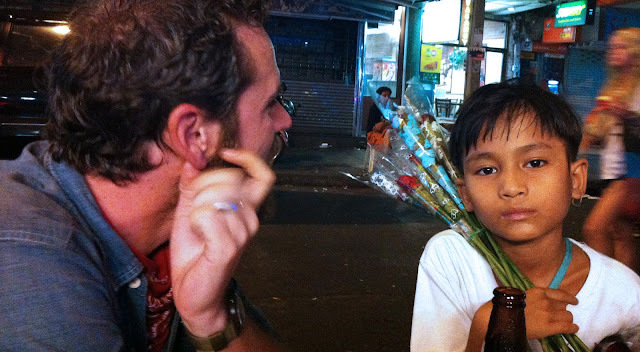 Matt was trying to talk to this kid but he no interest in chatting, just ready to unload his wilted roses. It was 3 am. 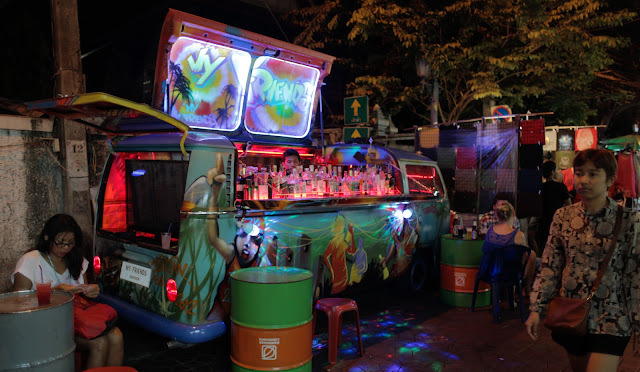 Loved hanging out at this street-side bar, made from a converted VW van. We love used book stores around the world. 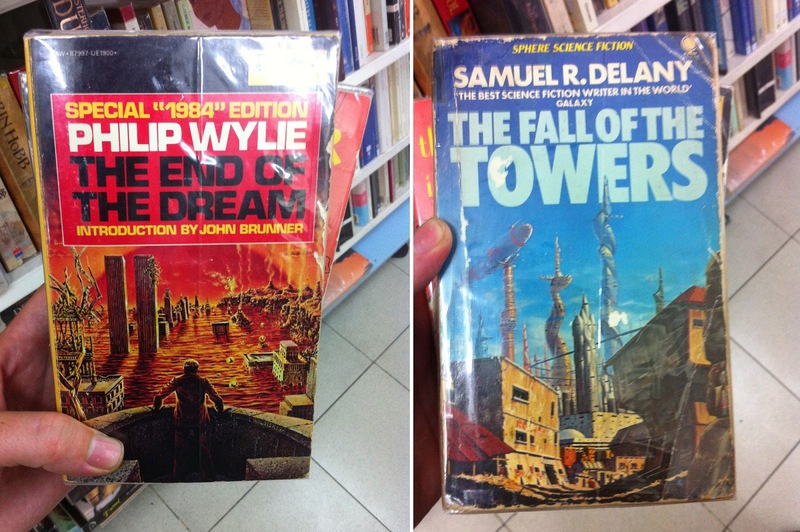 Matt especially loves finding obscure sci-fi paperbacks. It's a fetish. Bangkok is a cat town. We love it. We stumbled on some real Muay Thai. Cultural experience, check! Waiting for the teams to line up. Matt took a few too many pictures of the sign girls, I think. Drunk kids riding home in a tuk tuk. Wat Arun in the fading light of day. Our flight arrived in Bangkok shortly after 2am. Apparently late arrivals are the norm here, the guidebook even warns you not to fret too much about it. 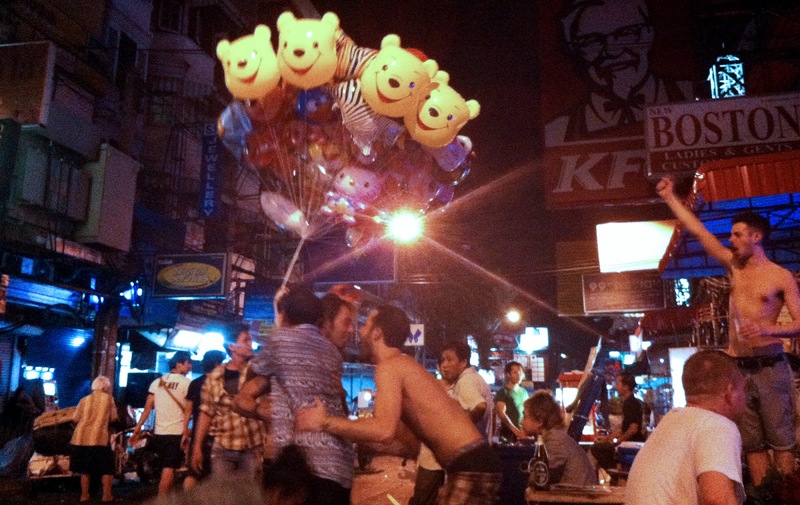 Our guesthouse was a small place and the instructions were to head to Khao San road, and get out at the Burger King. From there it's an easy walk down an alley. These instructions were discussed with the taxi driver, and he took a long hard look at the map (which had roads in Thai). As we neared our intersection the driver starts stopping to ask every 'working girl' if she (or he) knew our hotel. There were a lot of working girls, and no one knew the place. We tried to get him to take us to the crossroad as planned, but he apparently thought he could get us closer. We finally got out at the Burger King on Khao San road and walked the 3 minutes to our guest house (I was trying not to think he had deliberately driven around for 15 minutes for the extra baht). Unfortunately the place was closed. Locked up and dark. We went next door and took a room for a little less than the place we had booked online (we should have known you can roll up to Khao San at 3am without a reservation and be fine). We stepped out to the street for a beer (with ice) at one of the temporary bars that set up every night in the closed storefronts. We shared some street noodles, watched the little kids hawking flowers and then went home. As we headed through our guest house's "mixed use" ground floor, past the bar girls paying 5 baht to use the toilet, towards the rickety stairs draped in laundry, a girl asked us if we knew where we were going. 3 hours in Bangkok and we felt like we'd been here a week. We've been joking for weeks, months maybe about our next 'promise land', where we can buy the things we've been missing, have good Internet, basically live the easy life. Bangkok has turned out to be just that. 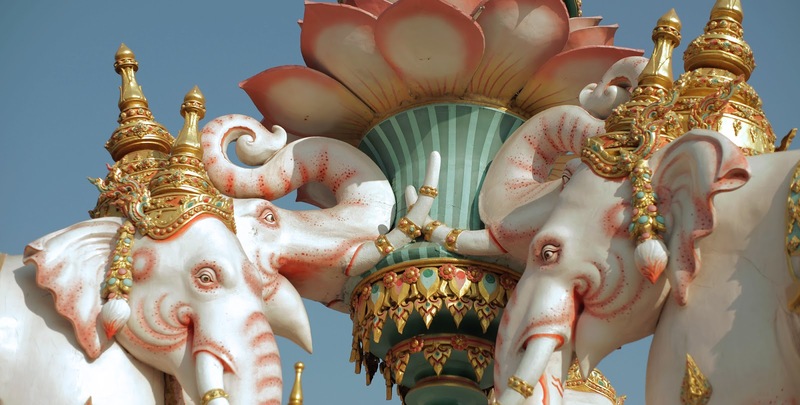 As happened in Kathmandu and Bangalore, when things are easy, we get complacent. We are happy to get out of the hotel by noon and feel pretty accomplished if we see one sight, or more likely, try a new street food vendor or new brand of beer. Maybe big cities make us feel like we're at home? Bangkok is also the start of a new phase in our trip and we really had a lot of planning to do on arrival. After much discussion and soul searching we have decided to leave Burma off the itinerary for this trip. If we had more time or more money, or hadn't been on the road for almost 6 months already, it might be different. We spoke to a bunch of travelers who had been there recently and they unanimously say it is expensive to travel and difficult. People have told us the tour groups are already there, but the infrastructure is not. Demand is higher than supply, and guest houses are asking exorbitant rates for less that stellar accommodation. People love it, but at this point we would have to choose just Burma, or Thailand, Laos, Cambodia and Vietnam. The people who have found it comfortable think of 20-30$ a night as cheap, but 15$ is the top end of our hotel range these days. I know that the magazines and web sites all say we have to "do it now before its too late". I'm hoping we can give the locals a little time to open more guest houses, maybe forge a backpacker circuit. Maybe it will go the way of Bhutan and we will be priced out completely, that is unfortunately the risk we have to take. We are disappointed as Burma was at the top of our list when we set out on this trip, but once again I refer to Lao Tzu, "A good traveler has no fixed plans, and is not intent on arriving" (it's my mantra).